Having read the Learn to Play guide and the Rules Reference, I'm still unclear on how the "2 hand slots" (and 2 arcane slots) work. Is the '2 hand slot' a second hand slot, or is it a slot specifically for two-handed items? For instance, which of these can I have equipped at the same time? Each character has two hand slots (because you have two hands) and two arcane slots (because...well, because). So you can have up to two one-handed cards equipped, or one two-handed card equipped of each type. To clarify even further, you could have the Flashlight and the Knife equipped at the same time, or you could have JUST the Baseball Bat. You could NOT have the Baseball Bat + Knife or Baseball Bat + Flashlight. Thanks for the responses. That's how I've been playing it, as that's what makes logical sense to me too. 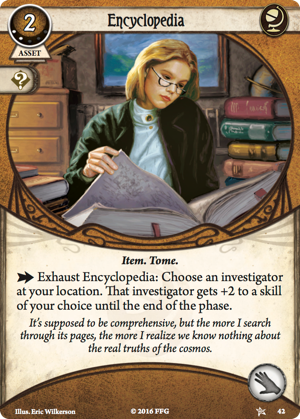 In the end, when you're looking at your deck, you'll have to decide for yourself whether you'd prefer the action-efficient reliability of an item like the Magnifying Glass (Core Set, 30) or if you'd prefer to use that slot for a more versatile—although less action-efficient—Tome like the Encyclopedia (Core Set, 42). ...which didn't make sense to me on first reading, because you could simply equip both - unless the 2 hand slot WAS specifically for two-handed items? But upon re-reading I see the intent was simply about wisely choosing the item you will use in any given slot. You're welcome! Thanks for the question, and have fun ghoul diving! 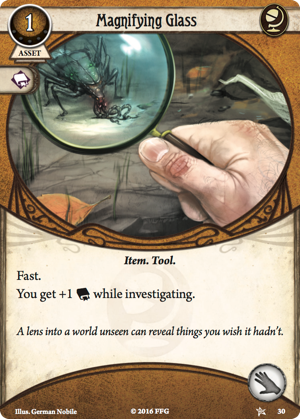 Can you discard items at any time as an action? I've noticed some cards say, when this such and such runs out of chargers discard it. But things like flashlight don't explicitly state this. No, you cannot discard your Assets from play at will. You either have to replace them when you play a new Asset that would use a filled Asset slot, or use the ones that discard themselves when they are depleted (like First Aid). Note that it's not really any disadvantage to having your Assets sit around empty in your play area. I guess technically they are not being recycled back into your deck for possible re-access from reshuffling or Scavenging, but it's not like they hurt you otherwise. I'd say just play another Asset. And if you are consistently finding that your gun is emptying and you never get a chance to refill it...then play more Assets so you can ditch the empty gun and hopefully recycle it. Not the best plan, but it is a plan. An uncharged asset is a good choice for Crypt Chill.